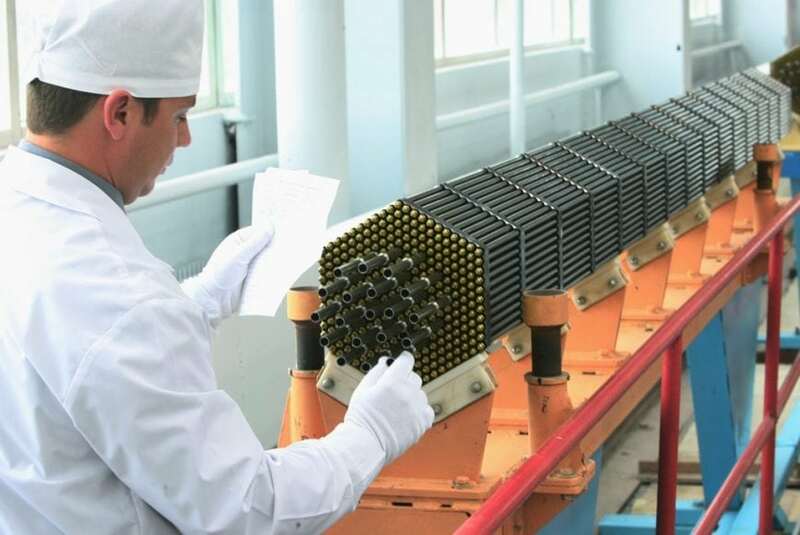 Fuel assemblies in nuclear reactors consist of bundles of fuel elements — metallic cylindrical tubes encasing fuel pellets — arranged in specific geometries in the reactor core. The material used to fabricate the tubes, know as cladding, must have a low neutron absorption propensity and a high thermal conductivity, as well as be chemically stable, strong, and corrosion-resistant. Such material is known as Zircaloy, a zirconium (Zr) alloy containing tin, iron, and chromium, added in different proportions to achieve the desired properties. Over time, however, Zircaloy tubes may fail due to the combined action of oxidation and delayed hydride cracking of the clad, a consequence of prolonged exposure to highly corrosive environments and neutron irradiation. The long-term integrity of the fuel elements in the reactor core is highly dependent on the response of the cladding to corrosion, and it is therefore imperative that reliable models of oxide scale buildup be devised. The challenge in such undertaking, however, is to develop physical models, not based just on empiricism and experimental data correlations, but on sound physics principles that may allow scientists and engineers to understand the fundamental mechanisms behind clad oxidation. Of particular interest is the anomalous growth of the oxide layer measured in Zircaloys, which is seen experimentally to follow a cubic root power law in time, contrary to most metals, which display square root time laws. One feature unique to Zr oxide is that it initially forms with a tetragonal crystal structure corresponding to a high-temperature phase (>1200°C). This is made possible due to the existence of interfacial stresses engendered by the size mismatch between the metallic alloy and the zirconium oxide. These stresses maintain the oxide under a state of compression, stabilizing the tetragonal phase even at temperatures as low as 300°C. However, tetragonal ZrO2 admits small deviations from stoichiometry that favor the accumulation of anionic vacancies. The concentration of vacancies decreases with distance from the interface (as does the volume fraction of the tetragonal phase, in favor of the intrinsically stable monoclinic structure), creating a charge gradient that has a significant effect on oxygen diffusion. In the work described here, a model of the evolution of the Zr oxide layer has been developed, accounting for thermo-migration (diffusion in the presence of a thermal gradient) and electro-migration (diffusion due to a charge gradient) of oxygen transport in the clad, in addition to standard thermally-activated diffusion. As well, the model is guided by quantum mechanical calculations of the stability of zirconium-oxygen compounds, which have been shown to emerge within the oxide layer in several forms, some of them —such as the ZrO phase— unknown to researchers until very recently. This points to the need to consider multiple layers representing different Zr-O compounds at the same time, as multiple experimental studies have shown. 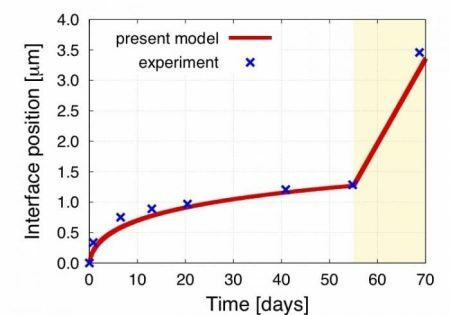 The model assembles all these new insights and successfully predicts the cubic root-of-time law observed in Zircaloys under service. The results point to electro-migration as the main driving force responsible for the deviations of Zircaloy from the general oxidation behavior of most metallic alloys. The figure shows the evolution of the oxide layer as predicted by the model compared to several experimental data (Motta et al., “Microstructural characterization of oxides formed on model Zr alloys using synchrotron radiation”, in: Zirconium in the Nuclear Industry: 15th International Symposium, ASTM International, 2009). The power law that best fits the model curves displays an exponent of 0.34, in agreement with the ⅓ expected evolution. These findings are described in the article entitled Multilayer interface tracking model of zirconium clad oxidation, recently published in the Journal of Nuclear Materials. This work was conducted by researchers in the Jaime Marian group at the University of California Los Angeles. Our group focuses on understanding materials evolution under extreme conditions using multiscale computational modeling. Formulating theoretical models of materials behavior under a variety of far-from-equilibrium conditions, e.g. shock-loading, very fast deformation rates, high dose and dose rate irradiation, ultrafast heating, etc., requires a deep understanding of a wide range of physical processes. This multidisciplinary nature of multiscale materials modeling endows students working on these projects with a broad knowledge base across many scientific disciplines. We develop efficient computational techniques to implement these materials models, taking advantage of large-scale parallel computing capabilities. At every possible scale, our simulations are benchmarked against and validated with experimental data to build confidence in the models. Specific areas of interest: are microstructural evolution and mechanical property degradation in fusion materials, simulations of plastic deformation in alloys, simulations of thermodynamics and phase transformations in functional materials, strength in nanostructured crystals, and simulations of irradiation damage in a variety of situations. The overarching goal of our work is to influence materials synthesis and design by understanding their internal evolution under prescribed conditions. Previous Post« Previous What Is Sublimation In Chemistry?